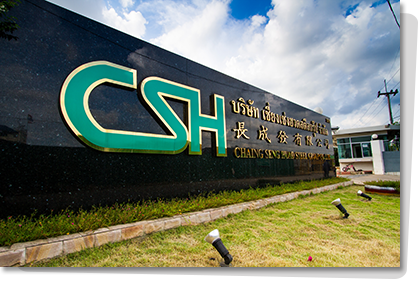 For over 20 years in steel business, our group, Chiang Seng Huad Co.,Ltd., C.S.H. Steel Co.,Ltd. and Chiang Seng Huad Steel Group Co.,Ltd., is one of the leading Thailand’s steel trading company for the usage in the construction industries. With our group, you can be ensured on product quality along TISI standard. Moreover, we are certified as authorized dealer in both hot rolled steel and cold rolled steel. In hot rolled steel, we are prouded to be dealer of many leading manufacturers in Thailand such as Siam Yamato Steel Co.,Ltd. (SYS), Triumph Steel Co.,Ltd. and Lao Kim Nguan Rolling Mill Co.,Ltd. (LRM). For cold rolled steel, we are deserved from Pitisawat Group. Our Mission are aimed on reliable quality product at a reasonable price, high quality service and delivery on time to best serve our customer.